Macomb, Michigan – Michigan Senator Michael MacDonald toured PTI Engineered Plastics to see a progressive manufacturing facility that dispels the misconception generally held by younger generations that careers in manufacturing are low wage, low-skilled jobs, that are performed in dirty factories. The Senator was shown how modern day technology is turning the factory floor “Smart” as the industry moves towards the fourth industrial revolution, aka, Industry 4.0. While PTI is still in the infancy stages of this transition, they believe that it will be the future of manufacturing. Highlighted was a new area under development in the plant that will soon hold their “Smart” machines. These machines will collaborate with each other, the workers, and in-time, the customer, via interconnected software. This will raise efficiencies by reducing downtime, waste, and wait times for customers. PTI also demonstrated some of the latest machine technology, and explained how that technology is helping them accelerate their processes. 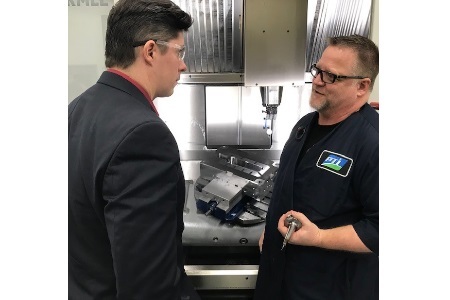 While hosting the Senator, they took the opportunity to discuss the manufacturing talent shortage in the industry, and the steps that have been taken at PTI to fill that shortage. In 2014 PTI established the PTI Technical Academy. The Academy was developed to introduce the fundamentals of the manufacturing industry to today’s youth, and give hands-on experience to high school students who may wish to pursue a technical career path after graduation. Students engage in part design, mold design, mold build, mold maintenance, CNC machining, EDM, process engineering, and process automation. This program is free to students in 10th, 11th, and 12th grades. PTI was pleased to host Senator MacDonald, and enjoyed the opportunity to showcase their facility and discuss the future of manufacturing. Headquartered in Macomb, MI, PTI Engineered Plastics is an industry leader in custom injection molding and manufacturing of plastic components and assemblies, with a specialty in low volume production. With 35 years in business, this technology-driven company has extensive capabilities in design, engineering, tooling, and low to high volume production with an array of secondary services. ISO Class 8 Cleanroom services include molding, assembly, and packaging. PTI is also fully versed in the IQ/OQ/PQ validation process. For more information, visit teampti.com.